Visual artist Andrea Arroyo, probably best known for colorful and lyrical images of goddesses, recently won first prize in the 2017 United Nations/Ranan Lurie Political Cartoon Award. The Washington Heights artist’s winning image is stark and powerful. 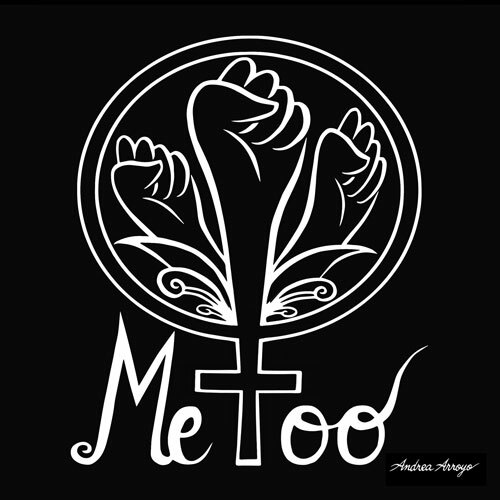 Three female fists, raised to the sky, surrounded by unfurling leaves, inside a Venus symbol that forms part of the “T in “Me Too.” The black and white work was published in The Manhattan Times in December last year. “I was so happy and so surprised,” she said. Not only is Arroyo the first woman to claim first prize in the international competition—she is the first woman to ever win any of the top prizes in the 13-year history of the award.